This section introduces the reciprocity of length contraction. Length of a moving object is shorter when measured by a stationary observer; and length of a stationary object is shorter when measured by a moving observer. Length of a moving object is contracted (shorter) when measured by a stationary observer in the moving direction. Length of a stationary object is contracted (shorter) when measured by a moving observer in the moving direction. Put the carriage on the ground and let Bob performs the experiment on the ground. Now considering Amy on the moving train, she will see the carriage and the ground is moving in the opposite direction. If we follow the same thought process used in previous sections, we will arrive the same conclusion in the opposite way. That is L = (1/gamma)*L', where L is the length observed by Amy and L' is the length observed by Bob. Red train passenger experiences with his fingertips a contracted green train car. 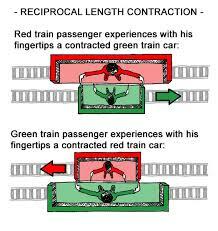 Green train passenger experiences with his fingertips a contracted red train car.